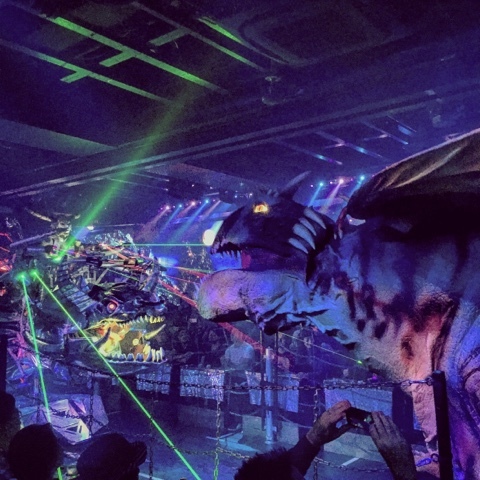 There are robots, and dinosaurs, and other types of robots, and some dinosaur looking things, it's the most exciting thing ever! Do you mind if we take a brief break here and I tell you a couple of things about puddles? And I should point out, before you answer, that I love puddles. I love how big and puddly they are. I love how wet with water they are. I love how leafy with leaves they can be. I love how incecty with dead incects they can be. I mean the things a puddle can be with a different way of saying itself are practically endless. Depending on the width of the puddle of course. I mean you get a narrow puddle diameter and it will NOT be wide with width. Or even broad with breadth. And you can bank that fact at the bank. Which, depending on your particular relationship with gullibility should be your brain. Obviously if you are heavily gullible then you can't call your brain your fact bank. Oh look, there you go again, believing a lie! Of course 'you' can call it your fact bank. You're a gullible person, which could be considered a sign that you are potentially on the the moron spectrum, so no one listens to you anyway, call it whatever the hell you want. Call it 'the source of 83.4% of the world's artificial seaweed' if you want. Cal Burch, the artificial seaweed baron from New Orleans? But no, this time I'm not, he's real. And yes he WILL stop you. Do you know how many people he's killed to become a true artificial seaweed baron? When he had them taste prototypes of his heavily chemical content artificial seaweed. And obviously it wasn't INTENDED for human consumption. You want to KEEP hearing that. So is it ok if I talk about puddles? Sorry about that moron stuff. You've been nothing but kind and sweet to me. We should hang out more. We could maybe meet in a dinosaurs mouth? If we're super cute together the dinosaur may well 'aww' so hard that it drools! If it drools a lot, it might land on yet ground. If it lands on the ground it may start a puddle! I love how dinosaur drool with dinosaur drooly they are!